We are no strangers to striped walls. 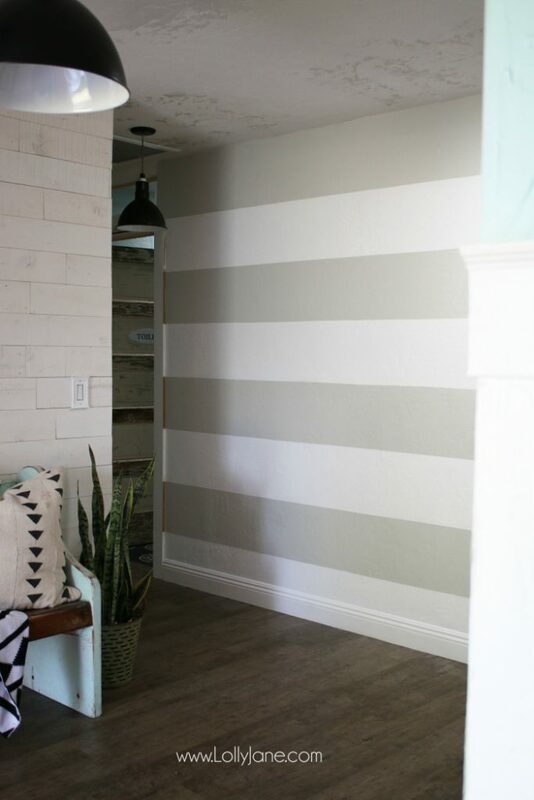 We’ve ombre’d the hallway, the craft room concrete floors, the front porch, the boys bedroom and now we’re going to show you how EASY it is to create an easy diy striped accent wall! If you’ve been following us on Instagram, you’ll have seen all the sneak peeks of my slow house renovation. We replaced the flooring after a flood which started the ball rolling on my stenciled bathroom floors and counters, raised the ceilings, installed solar tubes, created transom windows, added shiplap to the entryway wall, installed barn light pendants and are now ready for accessorizing! 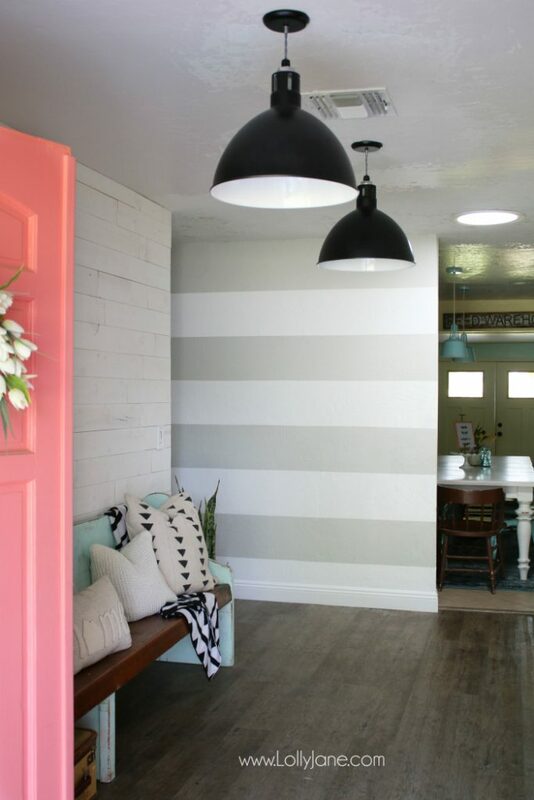 I am in LOVE with the gray and white striped wall! 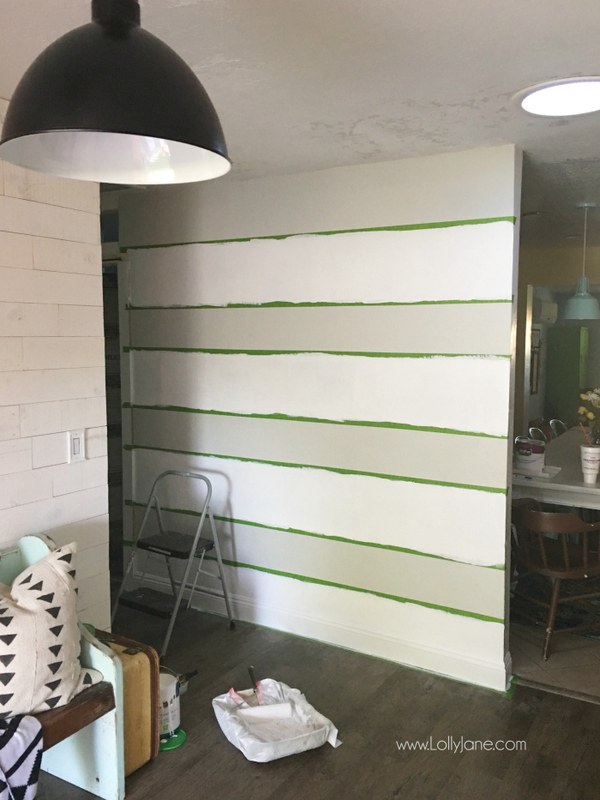 I’ve always wanted a striped wall but when we put up the board and batten wood wall treatment, it took away my options of striping. So glad to have it done, and done so easily with the help of Frog Tape! YAY for fast projects and no bleeding or touchups! 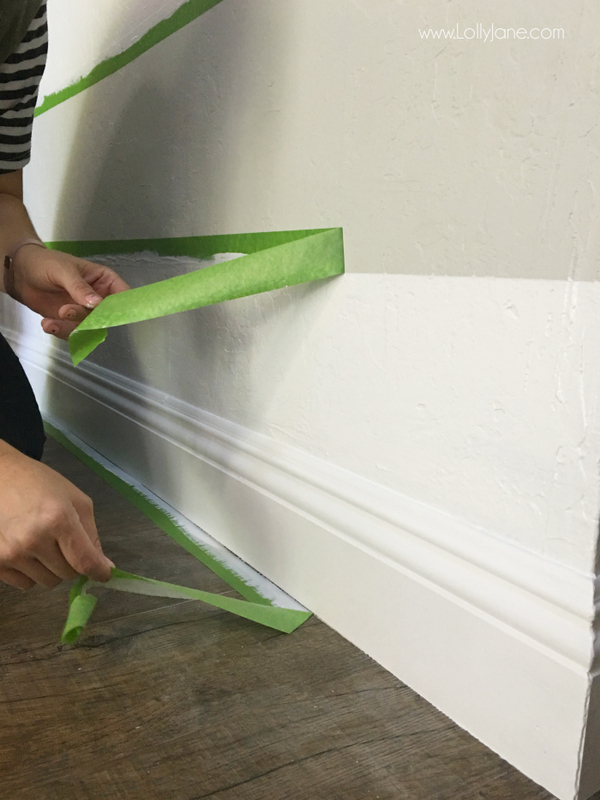 We love following the 2017 FrogTape Design Trends, specifically Timeless Touch. I feel like gray and white is a classic look, not too trendy and it can appeal to homeowners of all ages and styles. 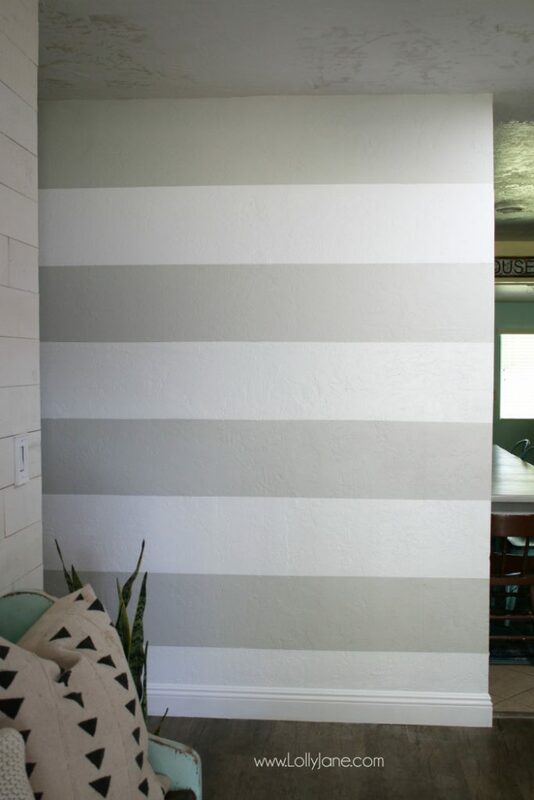 To stripe your wall, you’ll first need to decide on your stripe sizes. We went with 12″ tall. We painted the wall gray then gathered the rest of the supplies. 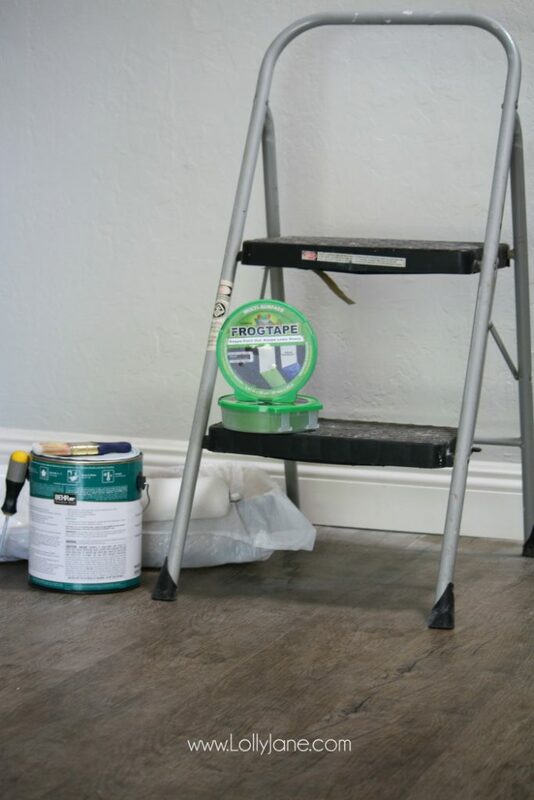 You’ll love FrogTape for its Paint Block Technology, it seals the edges and doesn’t cause bleeding. And my favorite part? No need to touch up!! 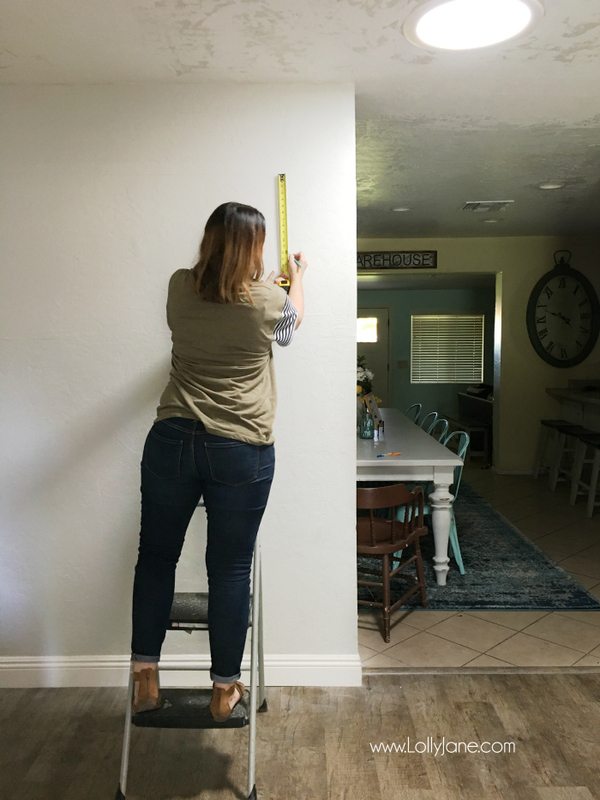 My wall is 92″ tall x 7.5′ wide so I made the top and bottom stripe a little taller than 12″ each to balance out the evenness. I also accounted for my white baseboards that were never painted after our flooring install. 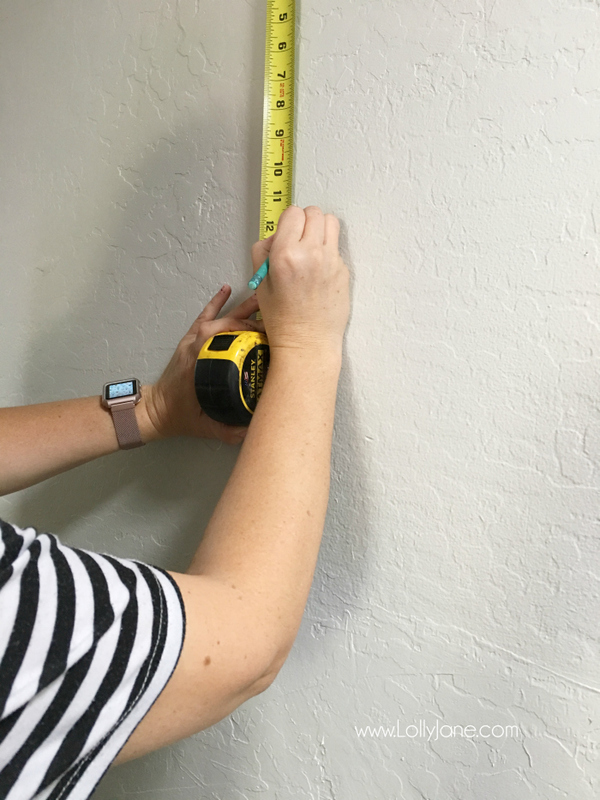 I marked 12″ down the wall then repeated the process lenghtwise so when I used my level, I could verify I was indeed hitting my 12″ marks to stay on track. After I measured it out, I followed my pencil line along the level to create straight lines lengthwise down the wall. I also made myself little notes on the tape before I started painting. For example “G” with an arrow meant it was staying gray. I also wrote “paint white” and drew an arrow to remind myself which color is which. Seems silly but when you’re in the groove, it’s easy to forget! 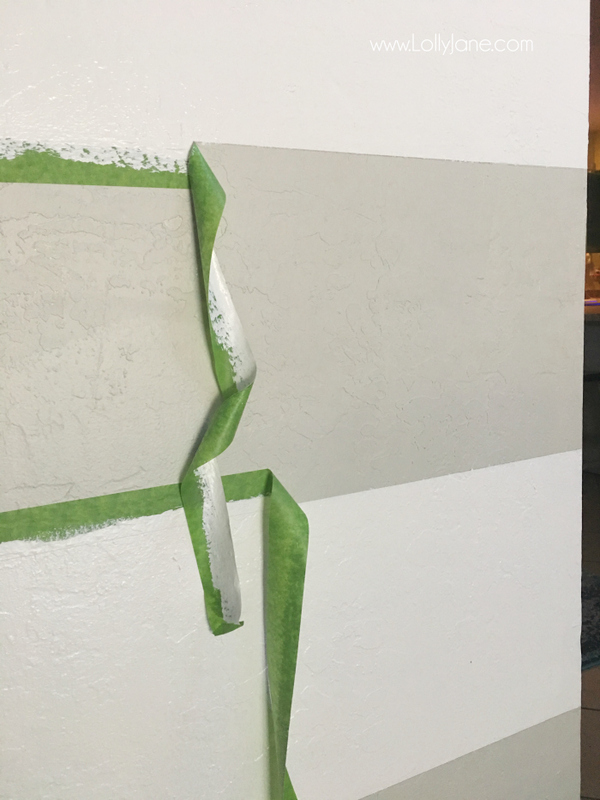 I rolled on 2 coats of white paint in between the marked pieces of tape. The total wall took a couple of hours total. Look how nicely the FrogTape peels off. I removed the tape when the paint was still wet, it slid right off with no required touchups, hallelujah. There you have it! 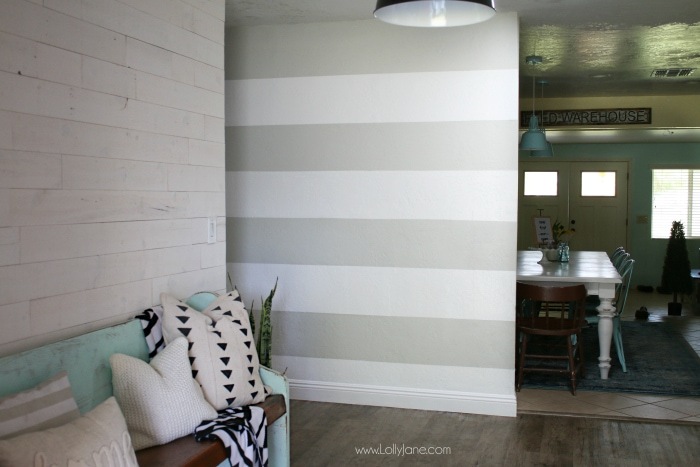 A fast accent wall with fail proof stripes! I’ve been working on my gallery wall and can’t wait to share it! I love the classic farmhouse style we’re creating since I do live in an actual farmhouse BUT I love my color so I’ll be adding that back in as well! PS: My new barnlights are gorgeous, right? Still on my to-do list: trim out the transom windows, paint the ceilings and baseboards, replace the front doors, shiplap the rest of the entrway, hang a shelf, build a hook rack and add a rug. WHEW! Good thing I have my favorite tape to keep me company when it comes time for all the painting in my future! 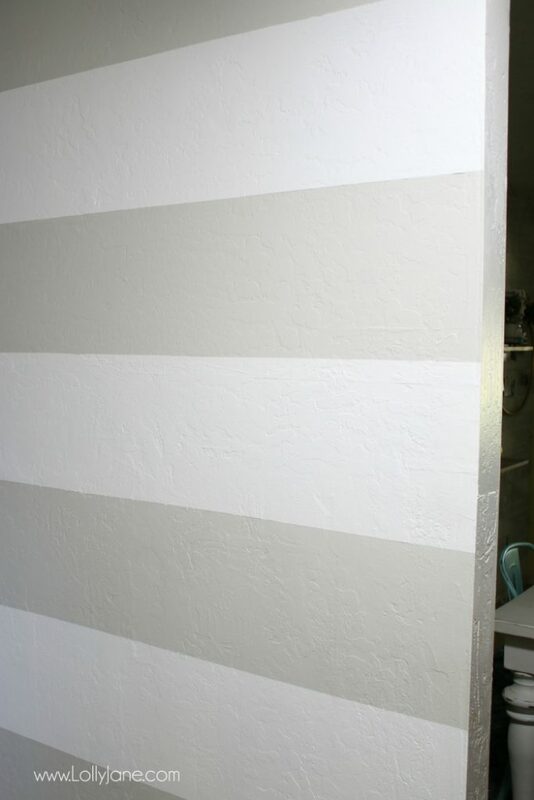 Please pin so your friends can stripe a wall too! I love this SO much! Your lines are perfect! I need you to just come decorate my whole house! Thanks for the inspiration , I love your designs. :). What color of grey did you use? Aww, thanks so much, Angie! It’s Moonshine by Benjamin Moore. 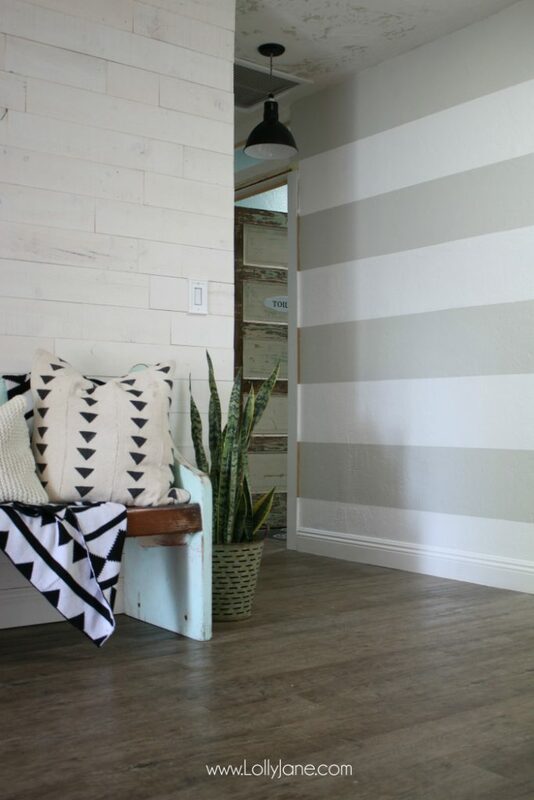 How neat is that wall – it looks great I must get some Frog tape !! 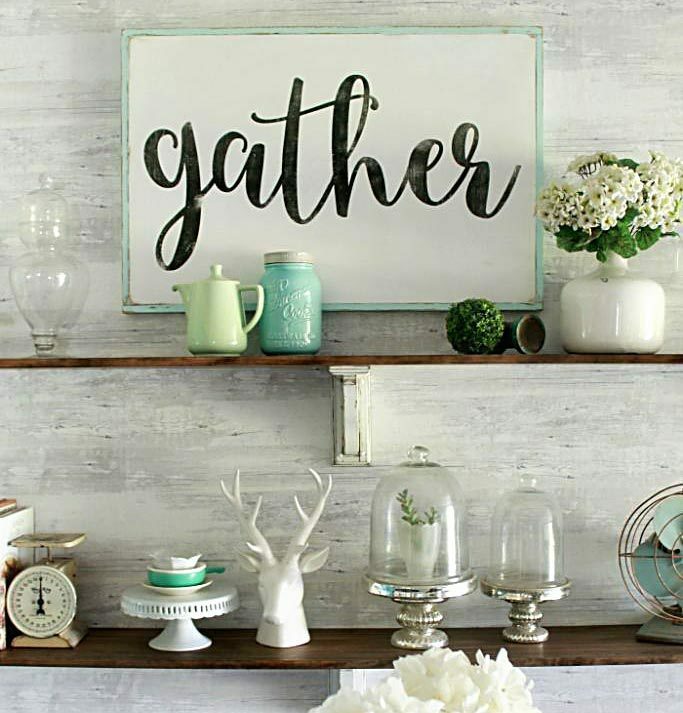 Yes, it’s such a great way to stripe things! 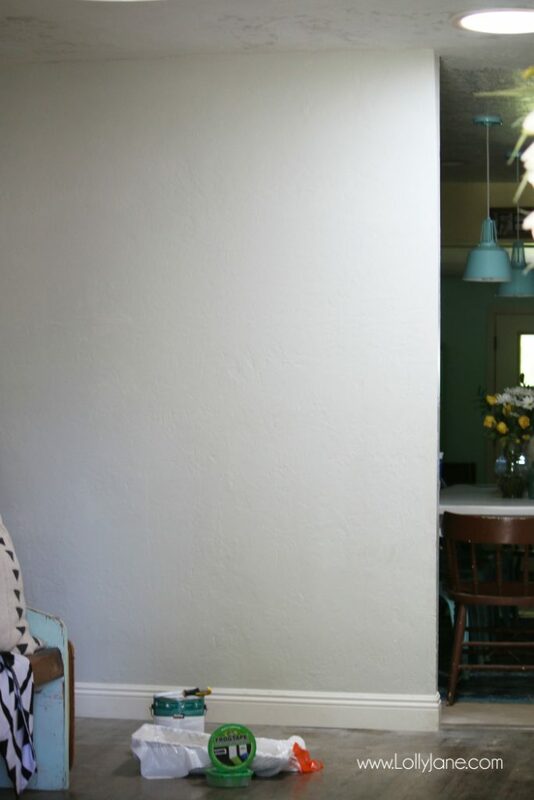 This wall is perfect for the casual spot you place it in. Its fresh and bright without being colourful. Love it. Wow! 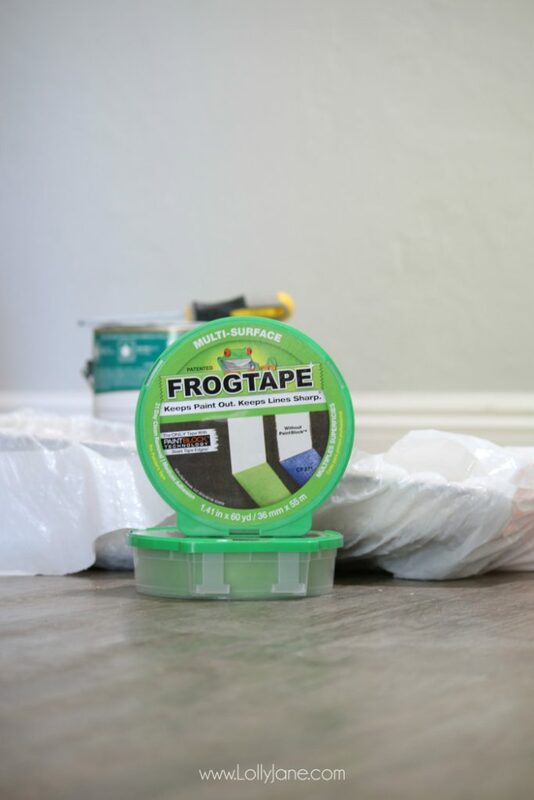 I’d heard FrogTape is *the* tape to use, and your post confirms that. Your walls appear to be textured as mine are and the lines still look crisp. I might give this a try! Thanks! YES! We love FT!!! 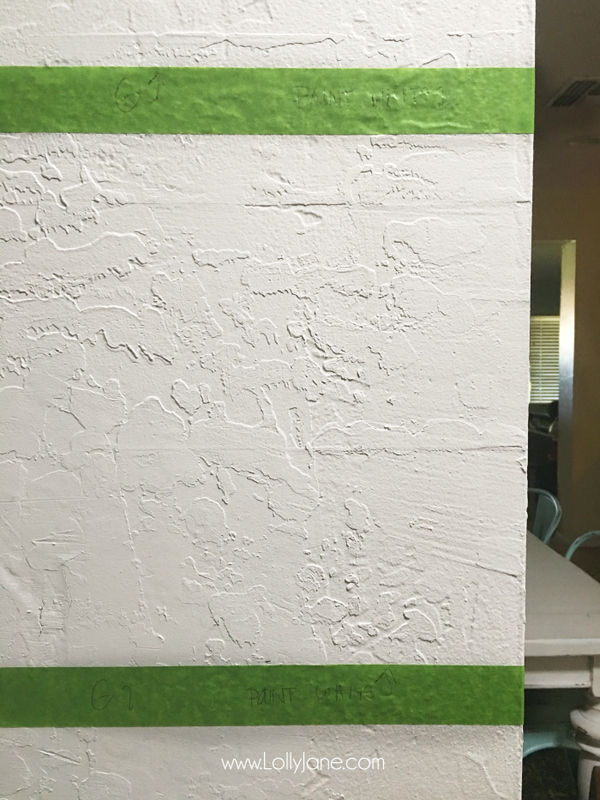 It’s great for textured walls! Hi – Love the wall. What color of paint is your front door?